Color-coordinated back-to-back 20 milers! 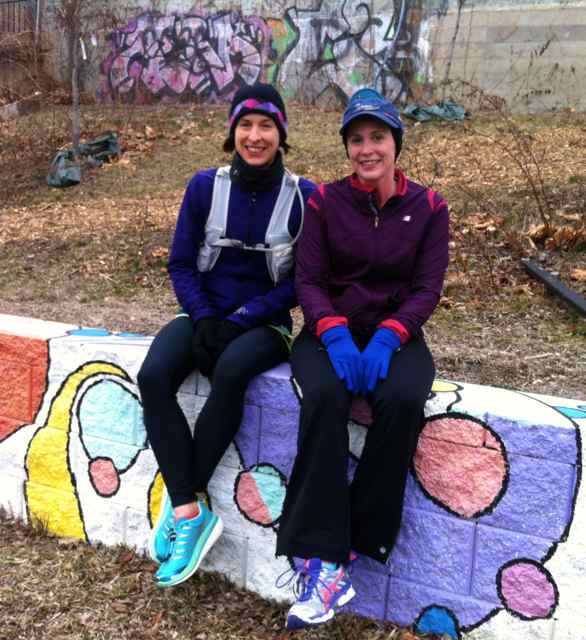 Today brings a Sunday stroll with Amy Couch and Stephanie Fonda along the Metropolitan Branch Trail, from Amy's 'hood to Union Station, where I buy cups of coffee for everyone. After a pause to visit the loo we head back. It's neat urban sightseeing, superb conversation, and nobody falls down. As usual, I underestimate the distance, and we overshoot the 18 mile goal on Amy's training plan. Stephanie and I add a little loop at the end to reach round numbers on all GPS systems we carry. Topics of discussion include analyses of ladies' sports garments, the value of a semester devoted to reading a 15-page dialogue of Plato in the original Greek, hair colors, ketosis, what's lost when college becomes vocational training, how to pronounce "cement" (CEE-ment) and "umbrella" (UMBER-ella) when speaking to family over the phone (Amy is from Arkansas), polarized training, and much much more. Runtastic and Garmin provide redundant data.